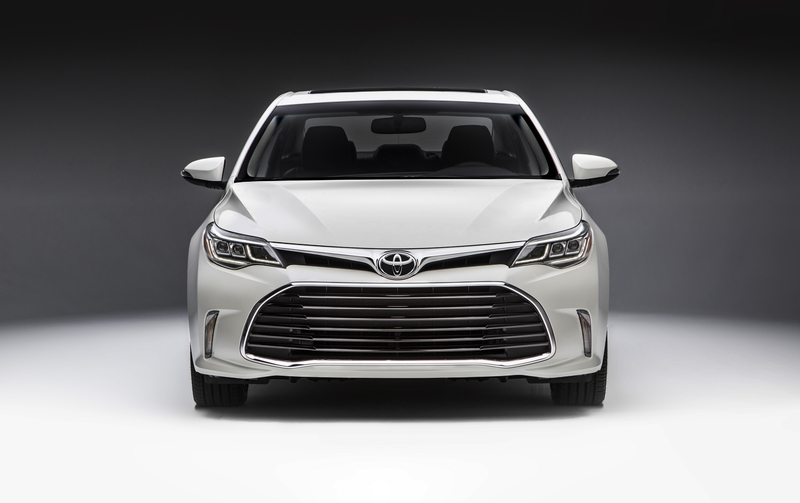 The 2018 Toyota Avalon makes a dramatic curbside statement, with a dynamic front end bracketed by LED headlamps including double-eye projector ellipsoid system low beams. Other premium features as standard include power adjustable heated mirrors linked to driver’s seat memory system and fitted with integrated signal lamps, a power moon roof with sun shade, dual, sculpted exhaust pipes, fog lamps and more. Door courtesy lamps welcome up to five adults to Avalon’s spacious and comfortable cabin. Premium entertainment and information is provided by a Display Audio with Navigation, Bluetooth connectivity, Integrated Sirius XM Satellite Radio, and more. Other technology features include a multi-information display, the Smart Key System with Push Button Start, Eco Indicator, driver’s seat memory system and more. Convenience, comfort, and premium style features abound – including automatic climate control, power-adjustable front row seats, power windows with auto up/down function on all windows and jam protection, leather-wrapped steering wheel with voice recognition, multi-information display, Bluetooth and audio system controls, chrome inner door handles, map lamps, 12v accessory power outlet, integrated garage door opener and more. Under the hood, the 268 peak horsepower 3.5L V6 features dual variable valve timing with intelligence, the direct ignition system, acoustic control induction system, and more to extract maximum performance and efficiency – with a fuel efficiency rating of 9.7L / 100km (city/highway combined). The six-speed super electronically controlled transmission features sequential shift mode operation and steering wheel-mounted paddle shifters. Drivers may select from Normal, ECO or Sport mode to tailor Avalon’s response to mood and road conditions. Every Avalon also features a full-size list of active and passive safety systems as standard. Headlining these is Toyota Safety Sense P – a bundle of advanced safety systems including Pre-Collisions System with Pedestrian Detection function, featuring forward collision warning and automatic emergency braking… Lane Departure Alert with Steering Assist function… Automatic High Beams… and full speed Dynamic Radar Cruise Control. Other features include the six active technologies of the Toyota Star Safety System (including an off-switch for the Vehicle Stability Control system), 10 standard airbags, a backup camera, direct tire pressure monitoring system, anti-theft system, LED high-mount stop lamp, and more. The 2018 Toyota Avalon Touring (Starting MSRP: $40,350) features a 7-inch” Display Audio System, dual-zone automatic climate control, 18” alloy wheels, leather seating, heated front seats, 8-way driver and 4-way front passenger power adjustable seats, and more. The 2018 Toyota Avalon Limited (Starting MSRP: $45,190) features a JBL Audio system with 7-inch” Display Audio and 11 speakers, unique 18” alloy wheels, three-zone independent automatic climate control with LCD colour control panel and rear seat controls, premium leather seating, heated and ventilated front seats, 8-way driver and 8-way front passenger power adjustable seats, variable cushion length driver’s seat, heated rear seats, aluminum scuff plates, an ambient lighting package, power rear window sunshade, the Blind Spot Monitor and Rear Cross Traffic Alert safety systems, auto-dimming rear view mirrors fitted with puddle lamps, automatic wipers, LED daytime running lights, and more. The 2018 Toyota Avalon is now on sale at Toyota Dealers across Canada. For complete and up to date details and specifications, visit www.toyota.ca/avalon.